There are three kinds of feeders that are chute feeder, slot type feeder, plate feeder. Chute feeder is widely used in chemical, mining, metallurgy, construction, mineral processing, coal and other industries to send block material from the storage hopper to the receiving hopper device. Chute feeder not only can be set up on the ground but also lifting in the warehouse unloading ore at the mouth. Tank floor makes reciprocating motion, the stroke time is 20-60 times/min, stroke is 20-200 mm. Stroke may be appropriately adjusted by the driving device eccentric wheel and the eccentricity is half a stroke. According to some mill practice, the viscous minerals, eccentricity should not be less than 30 mm. 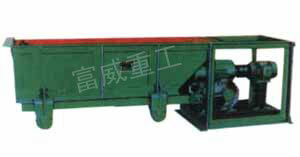 Feeder trough width is about 2-2.5 times of the largest feed particle size. The largest feeder trough can meet the particle size of less than 500 mm to the iron ore mine. The most commonly chosen specification is 980 * 1240 tank feeder, the feed particle size for 3500 mm, suitable for as 400 * 600 Jaw crusher of feeding equipment.